Published in the Proc. of the European Signal Processing Conference (EUSIPCO), 2014. Enhancement of a desired speech signal in the presence of background noise and interferers is required in various modern communication systems. Existing multichannel techniques often require that the number of sources and their locations are known in advance, which makes them inapplicable in many practical situations. 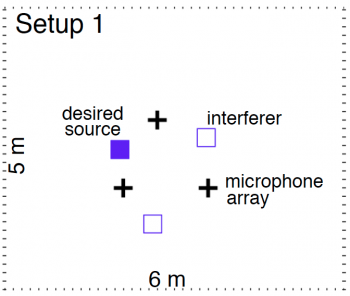 We propose a framework which uses the microphones of distributed arrays to enhance a desired speech signal by reducing background noise and an initially unknown number of interferers. The desired signal is extracted by a minimum variance distortionless response filter in dynamic scenarios where the number of active interferers is time-varying. An efficient, geometry-based approach that estimates the number of active interferers and their locations online is proposed. The overall performance is compared to the one of a geometry-based probabilistic framework for source extraction, recently proposed by the authors. Room size: 6 m x 5 m x 3 m. Three uniform circular arrays were used with diameter 2.5 cm and with three microphones each. Further details about the setup and implementation can be found in the paper.